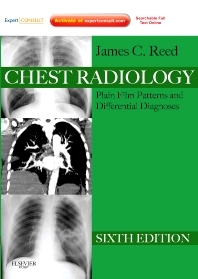 Chest Radiology: Plain Film Patterns and Differential Diagnoses, 6th Edition, by James C Reed, MD, provides expert guidance on interpretation of the most often seen radiologic patterns of chest disease. The new edition continues to emphasize pattern recognition on plain film -- with correlative CT, MR and other important modalities included where appropriate. Each pattern is introduced with radiographs followed by a series of questions, tables of differential diagnosis, and discussions of the most likely diseases to present with such a pattern. The discussion sections emphasize the importance of clinical correlation to narrow down the differential diagnosis, and what follow-up tests are indicated to definitively confirm a diagnosis. New high-quality digital images and updated questions enhance the latest edition of this trusted reference. Get all you need to know about the fundamentals of plain film chest radiology as well as CT, MR, and other important modalities. Overcome clinical challenges with guidance about the pitfalls of plain film radiography, and indications for CT, HRCT, biopsy, and other procedures.